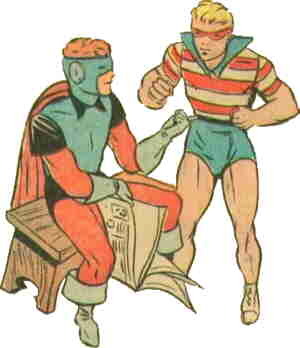 appearing regularly as members of The Young Allies months before The Shield's Dusty the Boy Detective and The Wizard's Roy the Super-Boy (no relation) started having adventures together as The Boy Buddies. It was a very early use of spin-offs for MLJ, the company which, after re-naming itself for its most popular character, Archie, eventually came to subsist almost exclusively on such spin-offs as Archie's Pal Jughead, Life with Archie and Little Archie. They gave The Hangman his own comic (the first issue titled Special Comics, and later ones named after the character himself), and the two Robin-inspired sidekicks became co-stars in his back pages. The gig started in Special Comics #1 (Winter, 1941-2) and continued in Hangman Comics #s 2-8 (Spring, 1942 through Fall, 1943). When The Black Hood replaced The Hangman on the publishing schedule, Dusty and Roy remained for the first three issues, ending with the one for Summer, 1944. The first few stories were written by Bill Woolfolk, who had writing credits at Quality, DC, Fawcett and elsewhere. The artist was Paul Reinman (Mighty Crusaders, John Force). Later appearances were drawn by Bill Vigoda (brother of actor Abe Vigoda, who also drew several Pureheart the Powerful stories). The Boy Buddies series ran its back-pages course, then was dropped for good. The idea of a sidekick team wasn't revisited until, decades later, DC launched The Teen Titans. By that time, Roy and Dusty had been virtually forgotten. Text ©2008-10 Donald D. Markstein. Art © Archie Comics.